In this serene, angelic music, heavenly choirs are blended with slow, soothing synthesized sounds and showered with ethereal chimes. 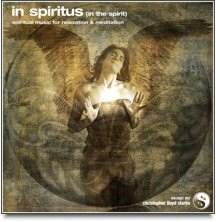 In Spiritus is very soft, but there is also an element of grandeur to this music – it’s almost cinematic at times. Quiet spaces slowly fill with angelic choirs and ethereal chimes that swell and bloom into glorious crescendos that will melt your heart. This deeply spiritual music is also interspersed with subtle, hypnotic interludes and is occasionally visited by a soulful Bulgarian piccolo flute. In Spiritus will help to bridge the gap between your earthly self and your spiritual self - it's all about connecting with the highest aspects of your being. This music is very gentle but it is also powerful and can lead to emotional releases as you clear away negativity and really open your heart. Should you find yourself weeping as you listen - if you lose yourself in that special place between sorrow and ecstatic joy - then you are "In The Spirit".